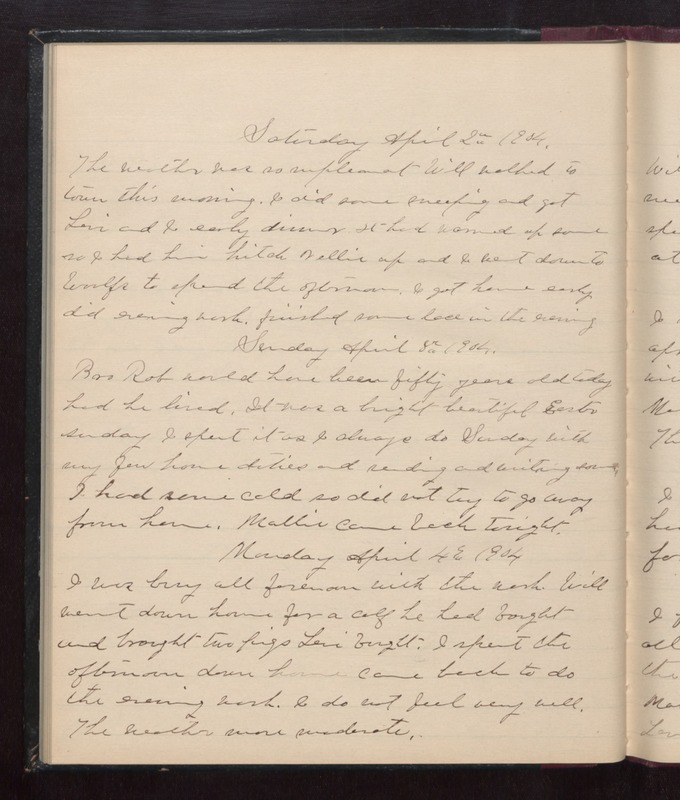 Saturday April 2nd 1904 The weather was so unpleasant Will walked to town this morning. I did some sweeping and got Levi and I early dinner. It had warmed up some so I had him hitch Nellie up and I went down to Woolfs to spend the afternoon. I got home early, did evening work. finished some lace in the evening. Sunday April 8th 1904 Bro Rob would have been fifty years old today had he lived. It was a bright beautiful Easter Sunday. I spent it as I always do Sunday with my few house duties and reading and writing some. I had [some?] cold so did not try to go away from home. Mollie came back tonight. Monday April 4th 1904 I was busy all forenoon with the work. Will went down home for a calf he had bought and brought two pigs Levi bought. I spend the afternoon down home came back to do the evening work. I did not feel very well. The weather more moderate.